So basically I need this entire outfit!! I already have this top in black and white and I just ordered it in the blush pink color! That top is gorgeous! And I love the accessories as well, they compliment the outfit really well. Merci for sharing a great selection of nice things. I love all these feminine pieces! Anything blush, wins my heart! Such a pretty look, love those little loafers! This is such a nice outfit you’ve created, Rach! 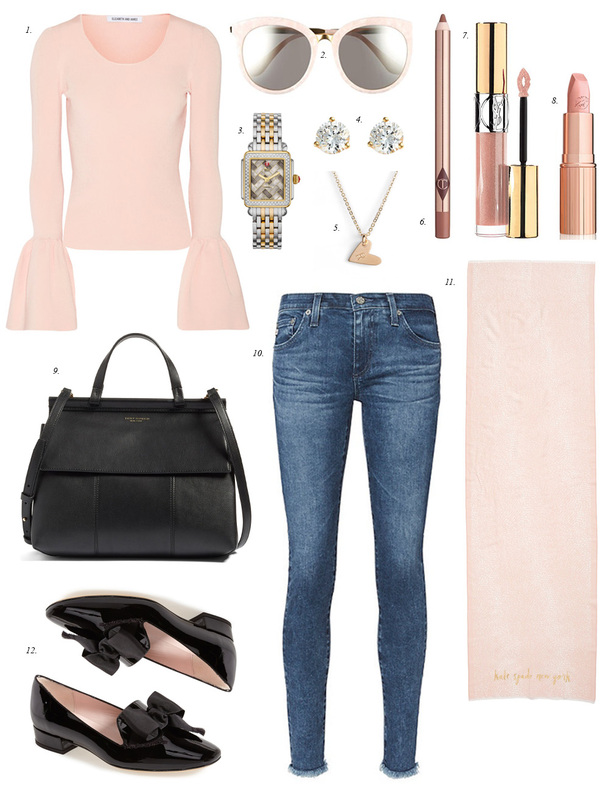 I love the top in the blush color, so pretty, and it looks so good paired with the black pieces. Thanks for sharing and I look forward to seeing how you wear it! I love that bag!! And that gorgeous bell sleeve top. So pretty!! Absolutely loved this top in black so I know the pink will look amazing on you! Also love the new Tory Burch satchel. Love the Bell Cuffs Full Tees! It looks snazzy and spiffy! Loafers typically aren’t my style but those are just too cute and actually look feminine! Good finds! need the top & shoes? Love this super feminine look! These shades of pink are soooo pretty and we are feelin those spring vibes! Thanks girls! You are so sweet! I love your style but can’t afford the high end styles. Could you recommend affordable options for your subcribers :).